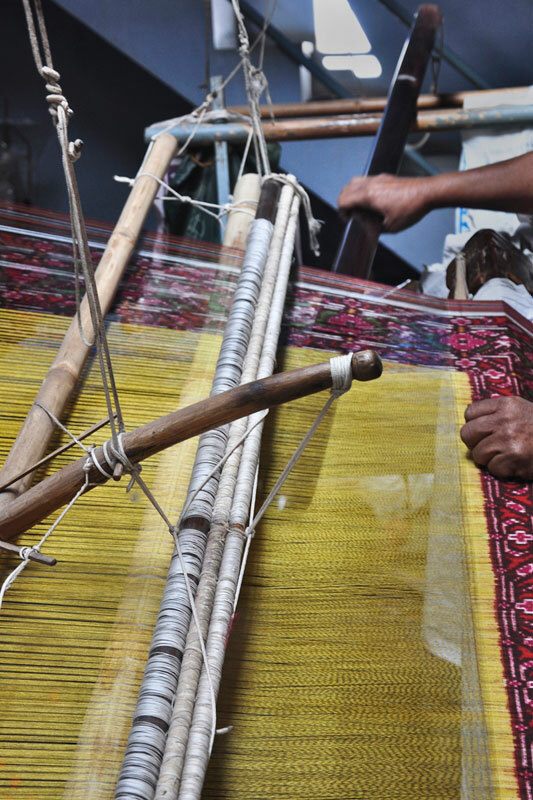 Patola sarees are well known for their distinctive geometrical style and colorful diversity, where the selected raw silk brought from the silk market are twisted which gives strength to the saree. 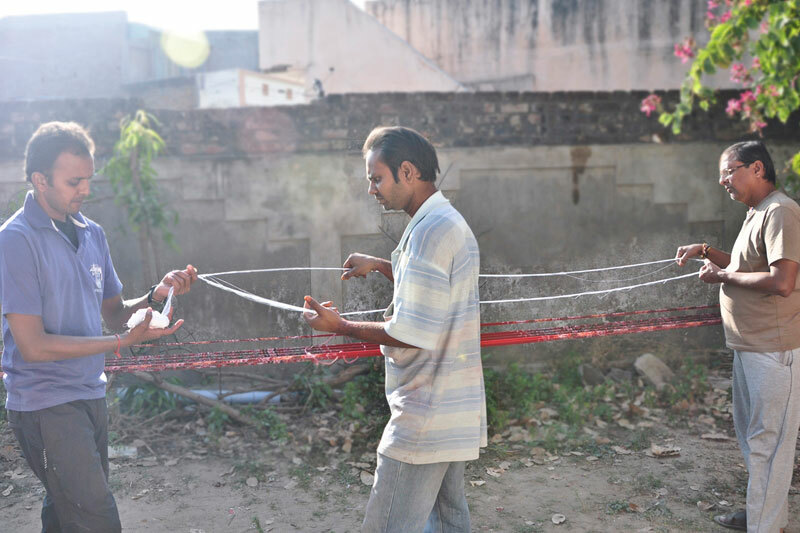 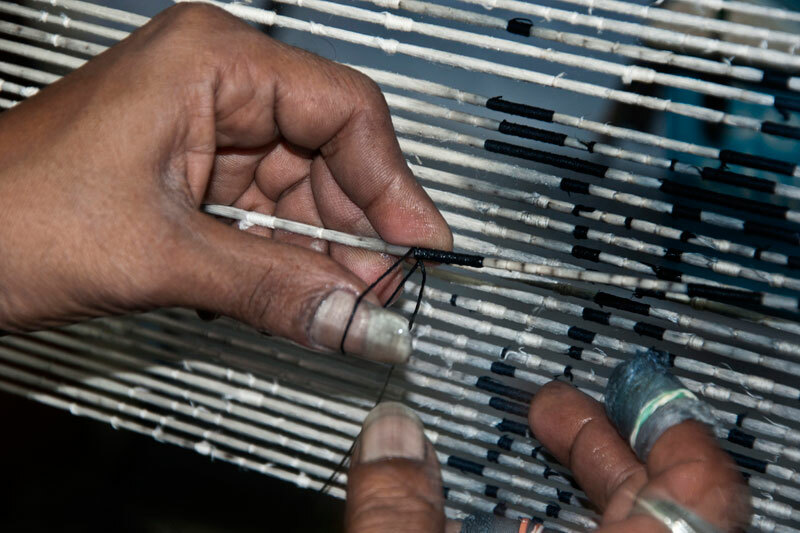 Twisted bundle of yarns are held on to the Aadha frame to which a thread immersed in the ink is used to mark on the yarns which is then tied with a thread dipped in water and tied tightly to the silk yarns. 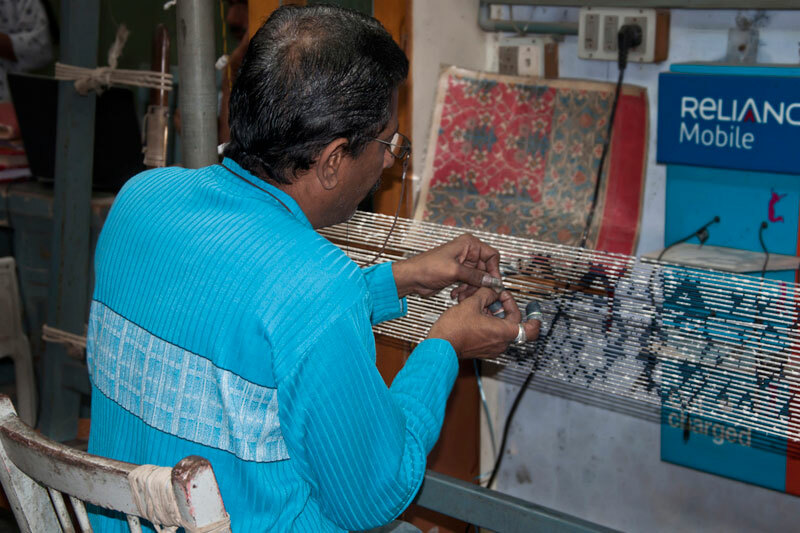 To obtain the selective motifs of floral, tiger and elephant on the saree, the warp and the weft yarns are characterized as per which the yarns of silk weft and warp are tied separately so that only the color to be obtained on the part of the yarn is only left open. 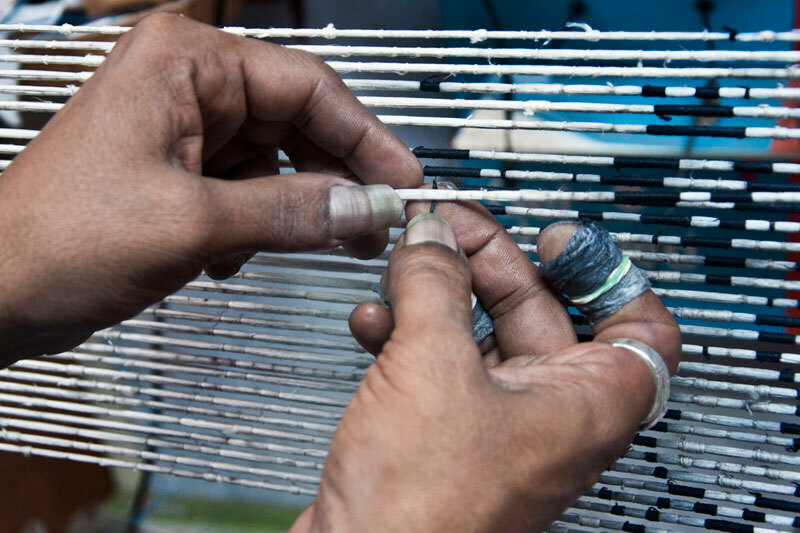 The parts of yarns that are colored are tied with the threads tightly and the open parts are immersed in the second color. 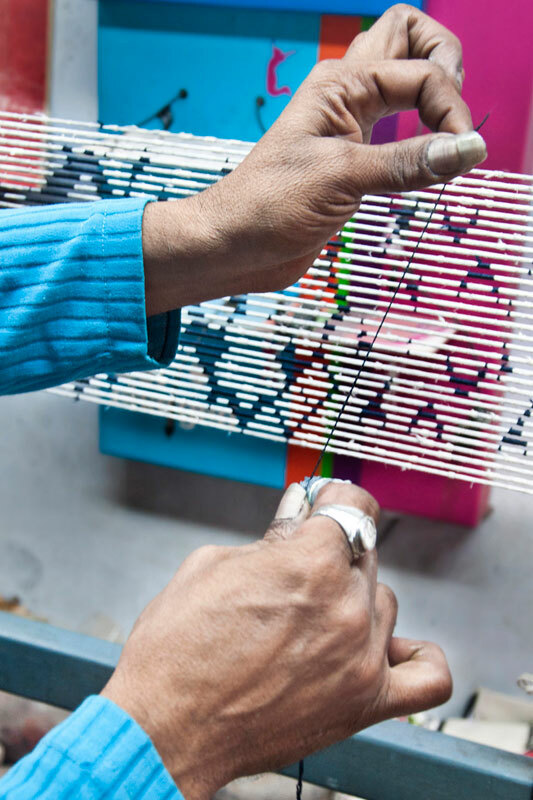 This process is repeated depending on the number of colors required for the warp and weft yarns which takes a minimum of about 75- 80 days for coloring. 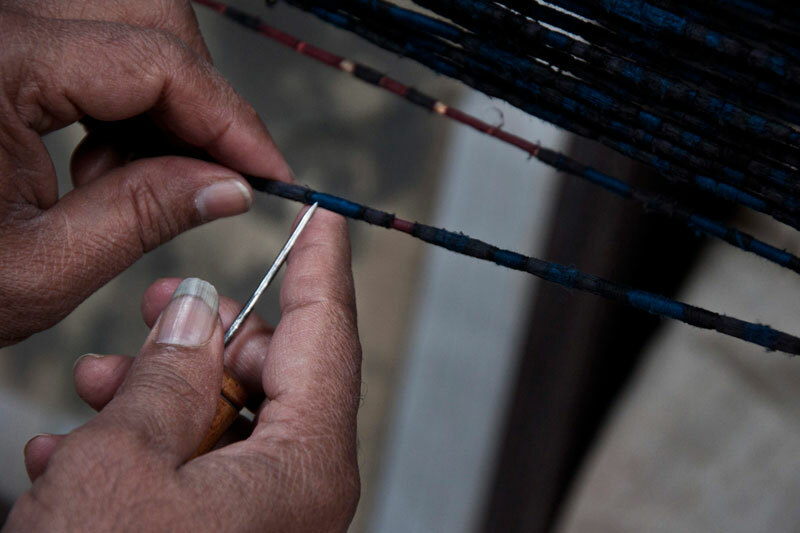 Coloring of the silk yarn is usually done with the acid dyes for better uptake of the color and also made from vegetable extracts and natural colors usually from flowers, marigold, sunflower, root bark, turmeric, madder, indigo etc. 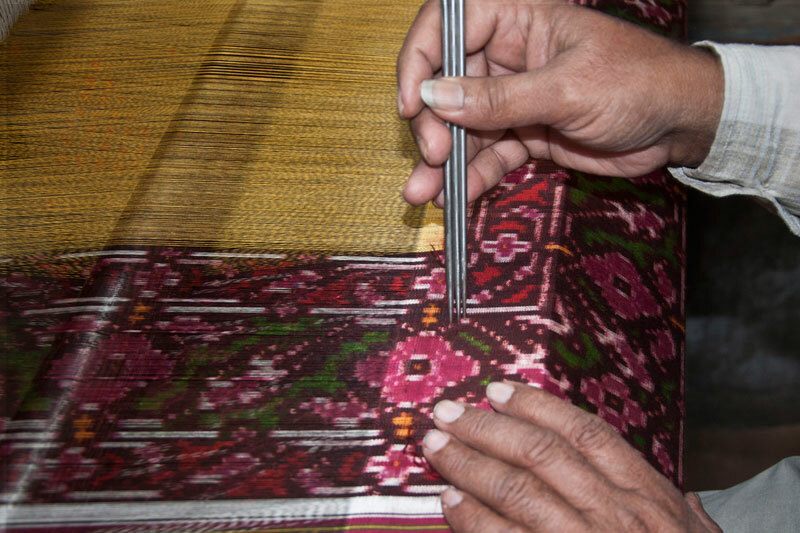 The warp and the weft ikats are aligned properly to manipulate, create the sheds and mend the broken ends. 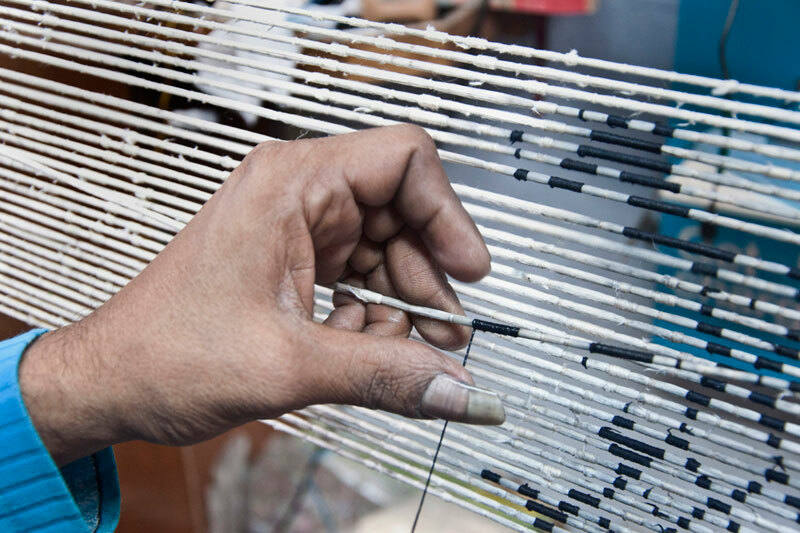 Usually, each warp consists of series of warp yarn and single weft yarn that binds the warp yarns together. 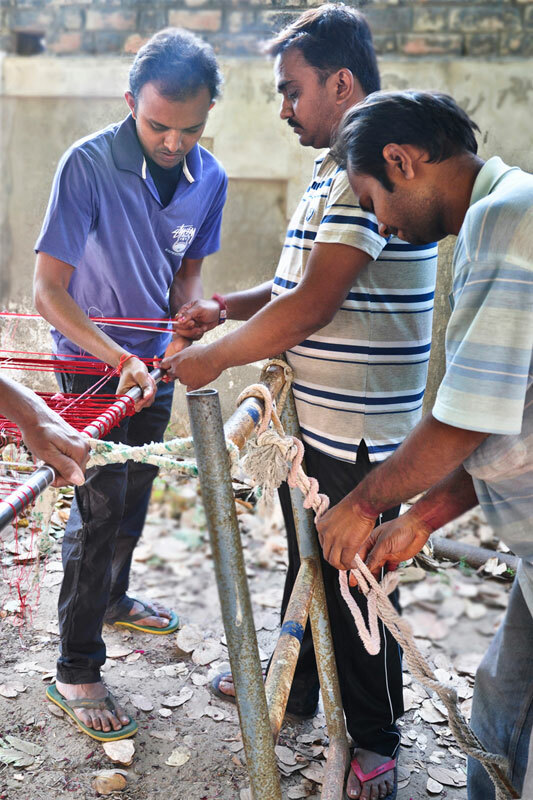 The segregated yarns are set up to the loom each time as there is no fixed framework. 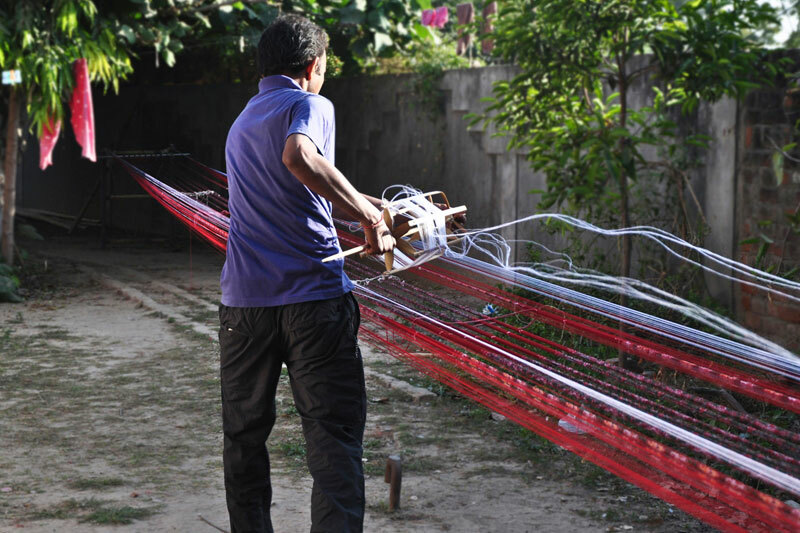 Patola saree making is usually in an inclined position which is fastened by a pole in the front and positioned in a slanted horizontal. 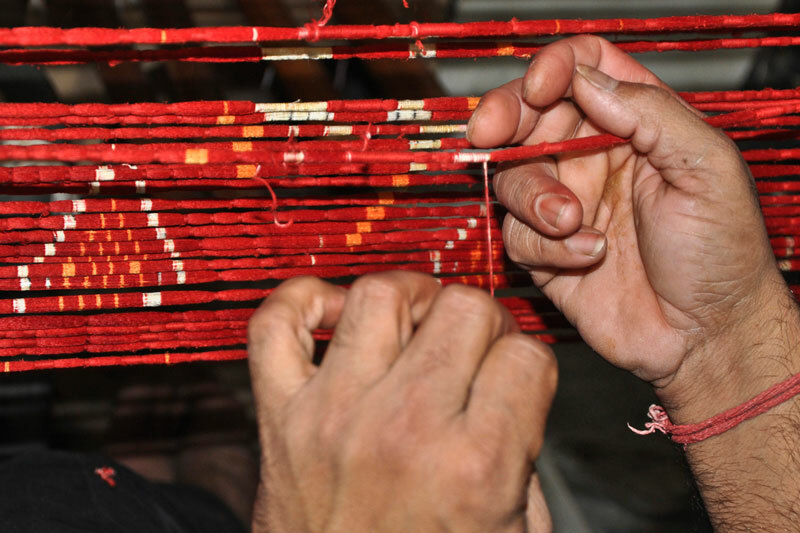 Half heddles are used to be held on a wooden rod (two main and two supporting rods) and shuttle used for this weaving is usually made of bamboo. 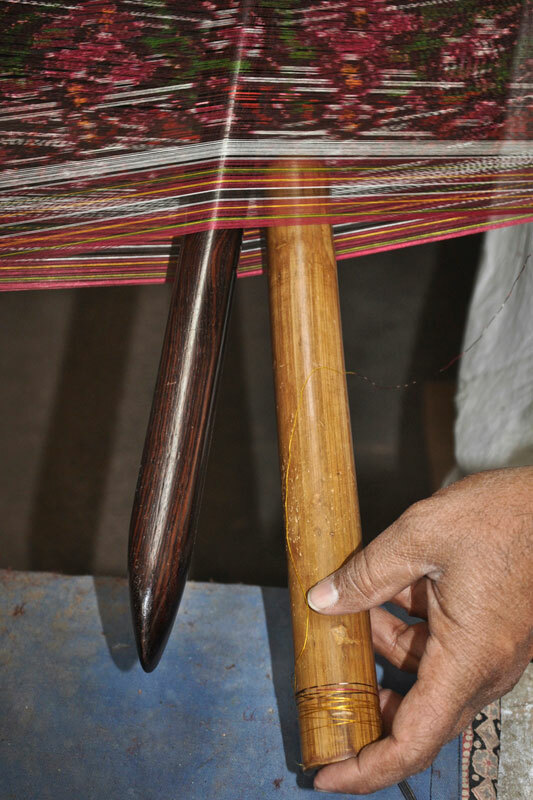 Looms are arranged in such a way that more light falls on the left of the loom through natural and artificial light which provides good illumination on the tilted weaving area by angular reflection such that the action doesn’t hamper the weavers vision. 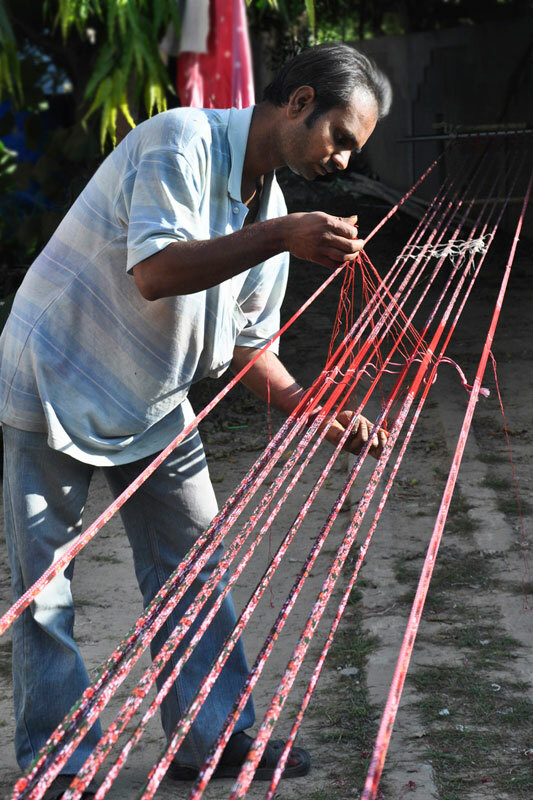 The loom is slant for the perspective view of the far ends of the woven area of the Patola fabric. 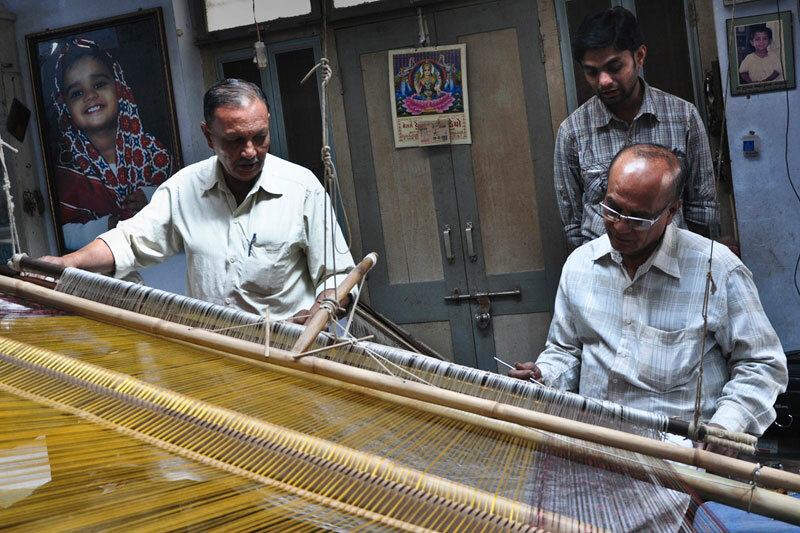 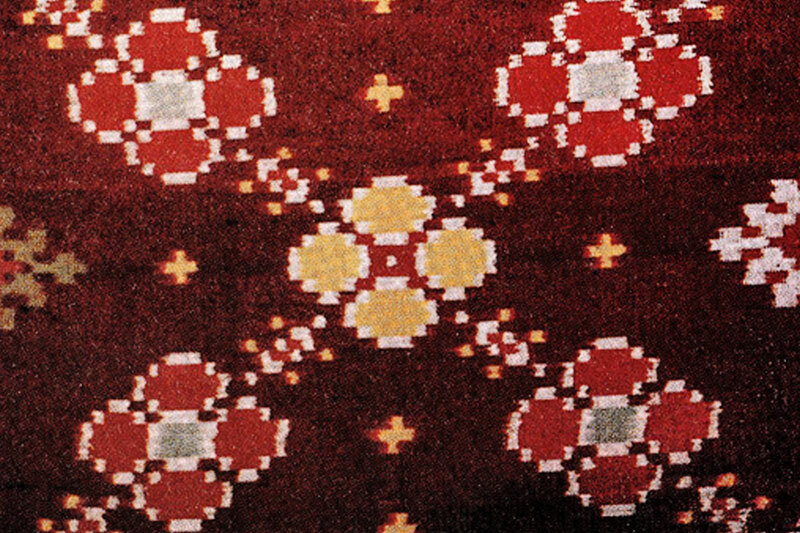 One weaver is positioned to the lower right side and the other weaver stands on the right side near the cloth beam distributing and organizing their work. 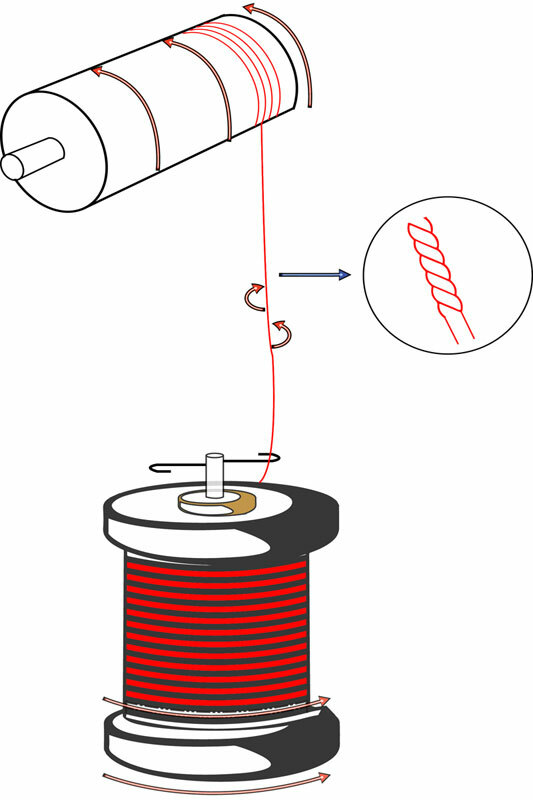 Right side weaver operates the shed stick/ beater and throws the shuttle from right and operates the pressure bar with handle to change the sheds. 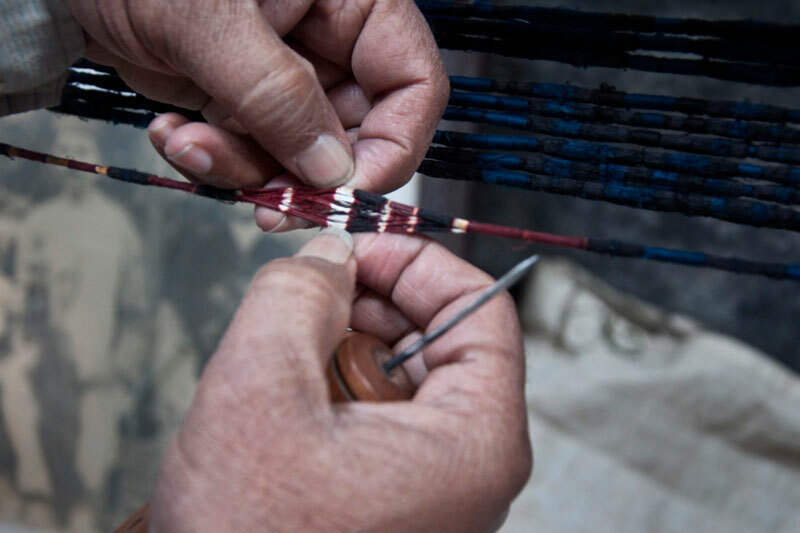 Both the weavers check for the matching of the weft and warp to adjust the slight shifting with the pointed quill-like needles for perfect color alignment. 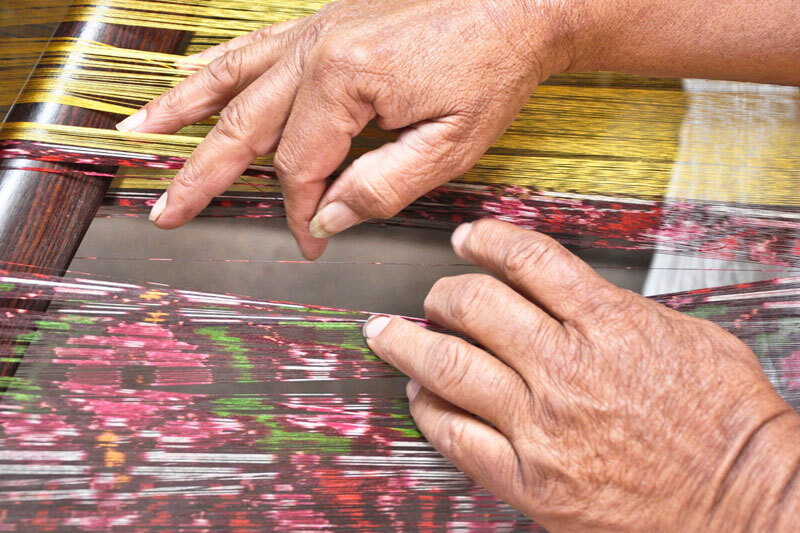 Only about five to six inches of the fabric can be woven for about three hours in a day. 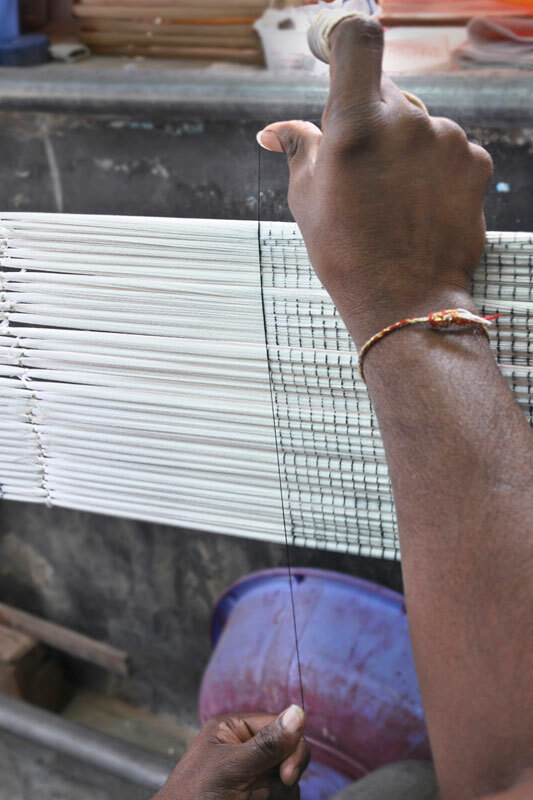 A bamboo shuttle is made to move to and fro through the warp sheds. 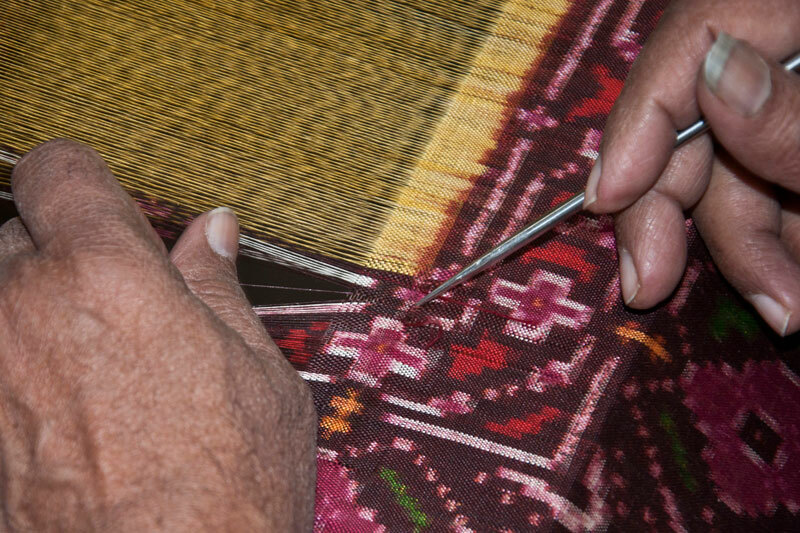 Even today Patolas are woven on a primitive hand operated harness looms which are usually made out of bamboo strips and rosewood.